2008 November « America, You Asked For It! Great Conservative Blogs this Week! After the crushing defeat the GOP suffered in this month’s election, there are plenty of bloggers offering their opinions on what went wrong and how to fix it. These are some great reads with good ideas on what’s gone wrong with the party and where to start to rebuild. Let’s start moving the party back to its conservative roots now! Our World on YouTube: Get Out the Vote for Saxby Chambliss! Just a reminder for any readers in GA or with friends/family in GA. The Democrats are looking for the supermajority in the U.S. Senate and this is our chance to keep that from happening. Get out the vote in GA on Tuesday and re-elect Senator Saxby Chambliss! The President-elect gives a special Thanksgiving message and once again turns his attention to the economic crisis. Finally, he seems to be getting it when he states that recovery will come because of the hard work and dedication of Americans. The 2008 elections dealt a crushing blow to the Republican Party. An almost filibuster-proof majority in the U.S. Senate, along with a strong majority in the U.S. House, and control of the White House will allow the liberal Democrats to push through just about anything they want. What happened to the Republican Party? What changed since Reagan left office, since the victory that signaled a resurgence of conservatism in 1994? When Newt Gingrich announced the GOP Contract with America, it appeared we were headed in the right direction. In 2000, G.W. Bush eked out a victory against Al Gore at the peak of an economic expansion that should have guaranteed a Democratic victory. How and why? Because half of all Americans were sick of liberal control! By 2004, Bush barely won again–probably only because of 9/11. He had pandered to the liberals too much. The simple fact is, the Republican Party doesn’t know how to act when it wins. I get the impression they try too hard to appease the liberal media–who is never going to side with the GOP, regardless of their actions. In ’94, the Contract with America gave us hope that Republican leaders really were going to take it to the Democrats. But, when Clinton fought back these same leaders caved. We received a mandate from the American people in 1994, but our GOP leaders’ attempts to gain favor with the national media quickly destroyed the voters’ faith in their ability to lead. Republican candidates must not only campaign on conservative principles, but fight for them throughout their terms. This will enrage the liberal media and there will be plenty of heat, but pandering to that media communicates weakness and exposes us to attack from our opponents. Our conservative principles are sound and will improve the lives of the American people–rich and poor, old and young, liberal and conservative. We must get this message out, and we must fight to implement it. We can no longer be satisfied with talking the talk. We have no choice but to walk the walk. All of this must begin with a massive reorganization and new strategies. Since we’ll never get fair treatment from the major news outlets, we must make use of what media is available to us. We have talk radio–unless the new three-headed Democratic government imposes the Fairness Doctrine, but we need more. That will involve making effective use of the Internet, which can’t be controlled by either party. If you’re tired of seeing GOP candidates promise to promote a conservative agenda then shift left or refuse to stand and fight for our values, visit http://www.rebuildtheparty.com/ and let your voice be heard! Together we can take our party back to its conservative roots and put it back on the road to victory! isn’t good enough for the gander, or the President-elect’s children in this case. It’s been widely reported that Obama’s two lovely daughters will be attending the prestigious Sidwell Friends School when they move into 1600 Pennsylvania Ave this January. It’s not surprising the Obamas would refuse to expose their children to the horrors of the DC public school system, especially when you consider their daughters currently attend the Chicago Lab School, a private school in their hometown. Tuition for the Obama daughters will run approximately $29,000 each at their new school compared to approximately $19,000 each at their old one. Well, which is it? Since the response emphatically denied he supports them, I’ll go with that. According to this report from the U.S. Census Bureau, public schools spend an average of $8,287 per student. While that wouldn’t pay tuition at either of the private schools mentioned above, it (or even a portion of it) might be enough to enable some parents to pay to send their children to a less prestigious institution. Why send that money to failing schools that resist real reform? Here, the NEA argues this would divert essential funds from improving public schools. This “give us more money and we’ll do better” argument falls flat since that’s been the policy for years. Take another look at the headlines from the DC district and tell me more money has solved the problems. What public schools need is a good healthy dose of competition! Remember also, I’m a teacher in the public schools saying this. Competition keeps an institution sharp, encouraging it to improve or be overtaken. On the other hand, lack of competition encourages maintaining the status quo. If vouchers become a reality, public schools will work harder to improve for the simple reason they must if they wish to maintain or increase their funding. Part of the argument opponents of vouchers use is that federal dollars will be diverted to religious institutions–in effect violating the separation of church and state, or establishing a religion. Wrong! Vouchers put those dollars back in the hands of parents and they choose where their dollars are spent. But let’s forget about these arguments against vouchers for a second and return to the most important part of this equation–the students. What’s the main goal here? That all students have the opportunity to receive a quality education. It’s not about teachers or administrators, but how can we ensure that every child in America is given a chance to make the most of his/her life. If that chance was available the public schools in D.C., you can bet the first daughters would be enrolled there. If the government is going to pay more than $8,000 per year to educate a child, why not seek the best available return on that money? If a school system doesn’t offer the child the opportunity to fulfill his/her potential, let’s give parents a choice to find a school that will. In the end it will be better for all. In the short term, some children will receive a higher quality education and in the long term all will because failing public school systems will be forced to improve. Not asked, not begged, but forced! Let me reiterate, I am not criticizing the Obamas for choosing a private school. If I were in their position, I’d do exactly the same thing. But I am criticizing him for not supporting vouchers and giving a similar opportunity for a quality education to all students. 1) That God sent His son to die for our sins. 2) My wife and two wonderful daughters. 3) My parents, sisters, cousins, aunts, uncles, nieces and nephews. 5) That I live in the greatest country in the world. 6) My job as a high school math teacher. I truly am blessed and fortunate and wish for many blessings for all my friends, both liberal and conservative. Feel free to use the comment section to let people know what you’re thankful for. Google has finally unblocked this blog so visitors no longer have to suffer through the warning page which stated it may be a spam blog. Finally. The first post was made on 11/6/08 and the block went up almost immediately. It took three times submitting it for review, but it appears readers will now be able to access this page directly. I look forward to all comments from readers, both liberal and conservative. After today’s announcement that Citigroup is being bailed out by the U.S. government, I thought I’d try to get a list of all the companies receiving money from this massive socialist program. Here’s what I have so far in order from greatest to least money received. I’ll update this list as it grows. It’s absolutely outrageous! And, this is in addition to the billions it will take to bailout Freddie Mac and Fannie Mae. It makes it really difficult to argue against government handouts and entitlement programs when we’re stepping in to finance irresponsible business practices by overpaid CEOs. We may not have to worry about Obama screwing anything up. Our entire capitalistic economy may be nothing but a memory by January 20. Here’s a CNN report on Bush’s defense of the bailout. Everyone should be outraged. If you’re as angry as I am, send this link to the White House, your representatives and your senators by following the links below. 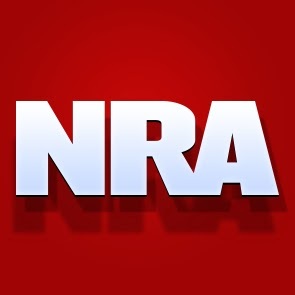 Before we become the USSA, the United Socialist States of America, let’s clog their phone lines and email systems and fill their mailboxes to let them know just how outraged we are! A promise that won’t be kept? But this is a good thing! Jim Kuhnhenn, of the Associated Press reports in this article that Obama may already be backing off an oft-repeated campaign promise–to increase taxes on Americans earning more than $250,000. Perhaps Joe the Plumber got through after all. For those who may have missed it, here’s the video that put Joe in the spotlight. This weekend, Obama introduced his team of economic advisers and, according to the AP, specifically stated that he would move forward with the tax cuts for those making less than $250,000 a year. Noticeably though, he avoided any mention of the oft-repeated campaign promise of raising taxes on others. When pressed on the issue following Obama’s remarks, aides reportedly said there will be no tax increases in the immediate future. This is the first good change I’ve had to report and its a change conservatives have been calling for in Obama’s platform. I don’t make $250,000 a year (Heck, I don’t even make 20% of that.) and I know many of you don’t either, but historical evidence shows tax increases don’t stimulate the economy and don’t increase government revenues in the long term. 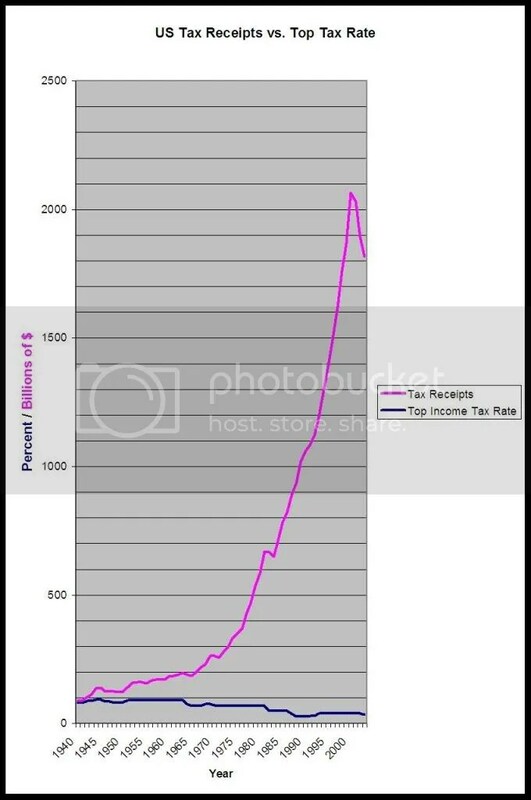 Take a look at this chart which compares the top tax rate with U.S. tax receipts. It’s clear from the graph that tax cuts tend to temporarily reduce tax receipts, but the long-term growth in those receipts that follows the short dip more than compensate. Compare the relatively stagnant growth rate when tax rates were at their highest with the booming growth as these tax rates were stepped down to their current levels. That’s all well and good, but how does the top tax rate effect the growth of the overall economy? For that, let’s look at the next chart which compares the U.S. Gross Domestic Product with the top tax rate. 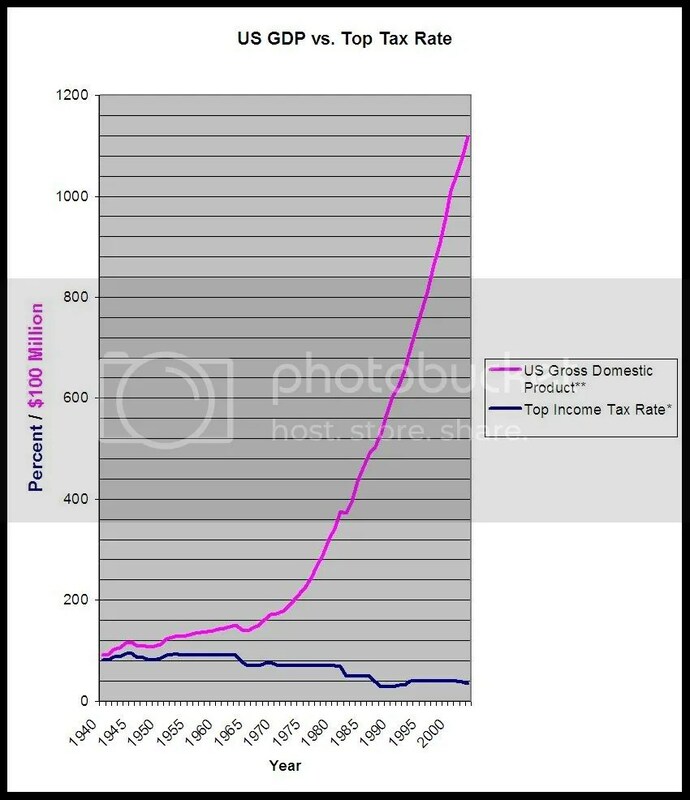 It’s apparent from these graphs that higher taxes stifle economic growth. When taxes are kept low, it leaves capital in the hands of consumers who know best how to spend their money. We don’t need more taxes, we need government to cap spending. If our federal government capped spending for 5 years, there would likely be a huge budget surplus available to pay down the mounting U.S. National Debt. We haven’t gotten there yet, but perhaps one day we’ll have a President who will demand Congress act as responsibly as the American people are required to act–paying their bills as they go. If Obama has reversed himself, this is a victory as conservatives have been harping on the dangerous effects on the economy if he did push through his vaunted tax policy. Let’s keep up the pressure and maybe the next four years won’t be as bad as we originally imagined. It appears the President-elect’s radio addresses will continue to be posted to YouTube. Here’s this week’s address. The address is primarily a rehash of his Emergency Economic Plan laid out in his Blueprint for Change. I previously analyzed the plan in this post. However, the campaigning Obama has evolved into the soon-to-be-in-office Obama. Gone is the Obama who, if elected, would immediately turn the tide and repair our diseased economy. Welcome to the elected Obama who now says we’re going to feel more pain, things will get worse before they get better. Well, at least we now know he is facing the reality of the situation. He goes on to say that he’s already directed his economic advisers to come up with a plan to create 2.5 million jobs by January 2011. In his Blueprint for Change, he states he already has a plan to save 1 million jobs that might soon be lost and he states he already has a plan to create another 7 million jobs over the next 10 years. That was the if-you-elect-me-I-will Obama. The soon-to-be-in-office Obama now says details of the plan will be worked out in the next few weeks. This sounds so Roosevelt-esque. I’ve said it before though, and I’ll say it again, Roosevelt’s New Deal didn’t get us out of the Great Depression. It did put people to work and boost morale, but real economic recovery didn’t begin until WWII. Take a look at this chart. The market peaked in October 1929 and didn’t reach that peak again until November 1954. That’s during a time when people took whatever job they could find. Our economy is in for a long hard road I’m afraid, and New Deal style programs aren’t going to solve the problem. It remains to be seen if Americans today will take a job “rebuilding our crumbling roads, schools, and bridges” after they’ve lost their jobs in air conditioned work spaces. Most people who’ve tried to hire folks from the unemployment office to work manual labor can tell you things are different today. I’ve tried and been told “it’s not worth it.” For this program to really work, there will have to be an ultimatum–take the job or no check! The options will have to be work or starve. The President-elect refers to schools that are failing our children. I teach in the schools and I can tell you there are teachers who are failing our children, but the problem is much deeper than that. I won’t make excuses for bad teachers and administrators, but I will say that many good teachers are driven from the schools by apathetic children and uncooperative, unmotivated parents. If you haven’t been in a high school lately, take a walk through and look at the shape your local school is in. If you see graffiti or property destroyed, guess who is causing the destruction. The students, because so many of them have no respect for themselves, authority, or anything else. Now, guess where that attitude comes from. The parents, who have become so accustomed to government handouts that they don’t respect themselves or anyone else. I’m all for ensuring teachers are doing their jobs, but if you want to really fix the problem with schools you’re going to have to change the culture of the students, and their parents. That’s not going to happen with more government handouts. Obama says he wants cooperation between Democrats and Republicans. In the past, bipartisanship generally means the minority party succumbs to the will of the majority. Call me a cynic, but I don’t think that’s going to be one of Obama’s changes. Brace yourselves ladies and gentleman for a long, hard road on the economic front. We the people have overspent to get ourselves into this mess, buying things we couldn’t afford and over-leveraging ourselves to a point that demands a swift kick to the backside. Our political leaders should have seen it coming, and most probably did, but they looked the other way because their only concern was getting re-elected. How we survive this mess, and if we survive it is up to us. Obama can’t save us, no politician can. He’s bracing us for this now that the election is over.